“Although common along the road verge in its native Mexico, you don’t see many ‘red torch’ on our shores. They produce masses of 5-8cm (2-3”) red/orange blooms which have a velvety quality to them. Given full sun, ‘Red Torch’ fills out to become a butterfly magnet in the garden, flowering from July-October. When cut, everyone wants to know where you got the incredible flower of the Incas.” Height 1.2m (4’). Sow from mid February to the end of March on the surface of 7.5cm (3") pots in a propagator, 13-18°C (55-64°F), or in a clear plastic bag on a windowsill using a quality seed compost. The seeds must have daylight to start to grow. Seedlings appear in 7-21 days. Transplant them one per 9cm (3½") pot and grow on prior to planting after the last frosts at spacings of 45cm (18"). 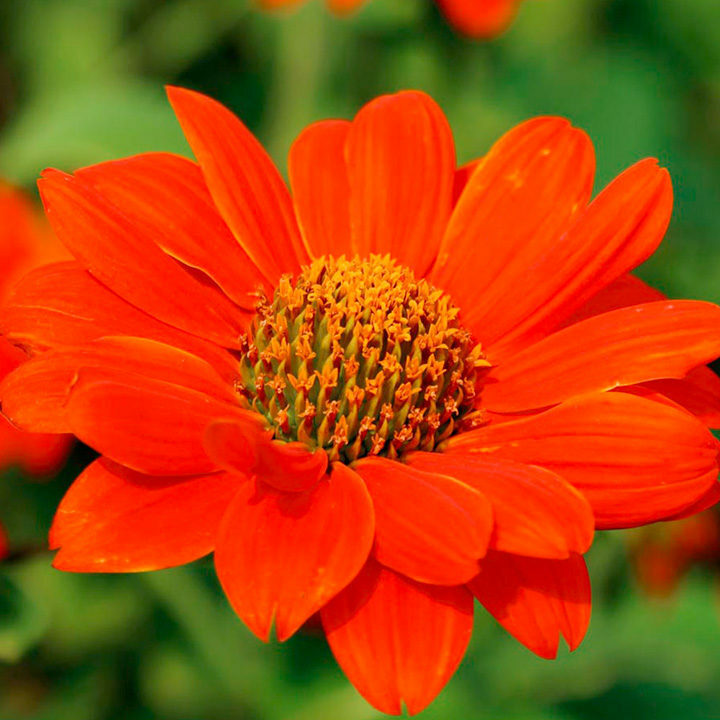 Make sure to dig in plenty of organic matter before planting out as Tithonia are greedy feeders.